In this guide, I am going to give you all of the information you need to plan your trip to Lucerne. I will outline the passport and VISA requirements, the times of year it is best to make your visit, the hotels and hostels I recommend, which restaurants and tours are worth checking out, and a list of the top things to see and do in the area. With this information in hand, you can be sure that your trip to Lucerne will be the trip of a lifetime. Before you start making any other travel plans, please make sure you review the table below so that you understand the immunization, passport, and VISA requirements for visiting Switzerland. A failure to understand these requirements could lead to not being allowed entry into the country when you make your visit. If you have additional questions on these requirements, please visit the US State Department website. NOTE: Beginning in 2021 the European Union will require authorization to visit the Schengen Area of the European Union. So if you are booking your trip after January 1, 2021, you will want to make sure you go thru the ETIAS Authorization Process. Lucerne is located in North Central Switzerland and sits next to the large lake that shares its name with the city. Because of its location, a stop in Lucerne in relatively easy to fit into a trip to France, Germany, or Austria. If you are looking to fly into Switzerland to visit Lucerne, your best bets are the major cities of Bern or Zürich. Both cities are just a short train ride or drive from Lucerne. Lucerne is situated in the ideal location to give residents and visitors easy access both to one of the largest lakes in Switzerland as well as the Swiss Alps. There is a great network of trains and lifts that access the upper reaches of the Alps from Lucerne and a ferry system that can take visitors across Lake Lucerne. Because of its central location, Lucerne is located relatively close to a number of large Swiss cities such as Bern, Zürich, and Geneva. In addition, if you are visiting France, Germany, Austra, or Italy, Lucerne’s central location also means that you are still relatively close to cities like Milan, Paris, Munich, and Graz. 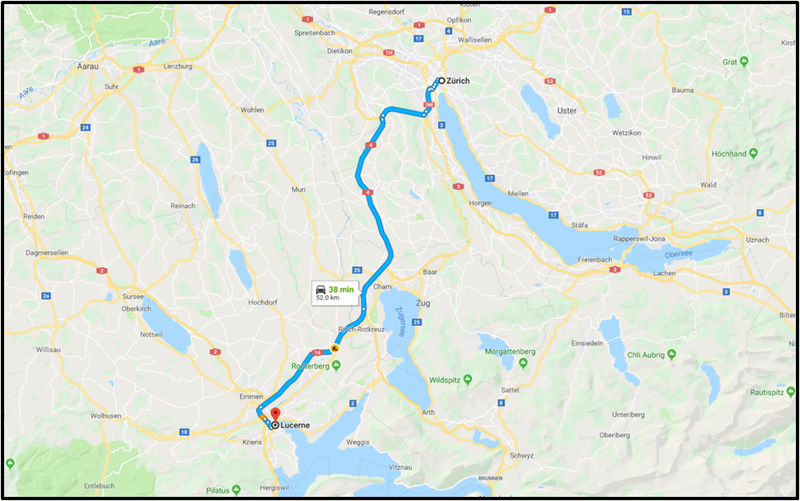 To give you an idea of how long it would take to travel from some other cities in the region to Lucerne, I have included a chart for you to review below. One of the easiest ways to get around Switzerland is by train. Switzerland has an extensive system of tracks that even reach the higher altitude cities in the Swiss Alps. In addition, in my experience traveling throughout Europe, I have found that Switzerland’s rail pass is the best pass in Europe. When you purchase the pass, you are able to use any train, boat, bus, or gondola (with some limitations) in the country for the duration of the pass. If you are traveling from Bern to Lucerne, the train ride is relatively short and inexpensive. You will pay roughly $43 US dollars for a one-way trip and the trip will take roughly 1 to 1.5 hours. The good news is that trains leave Bern for Lucerne roughly every half hour, which makes travel from Bern to Lucerne rather convenient. Trains leave Bern for Luzern roughly every 30 minutes. Some stop in Olten and some are direct routes. Travel from Zürich to Lucerne is even easier, cheaper, and more convenient than traveling from Bern. A one-way trip to Lucerne from Zürich will only cost you roughly $28.46 US dollars and the trip will take under an hour. Not to mention, with three trains running from Zürich to Lucerne each hour, it isn’t hard to catch one. 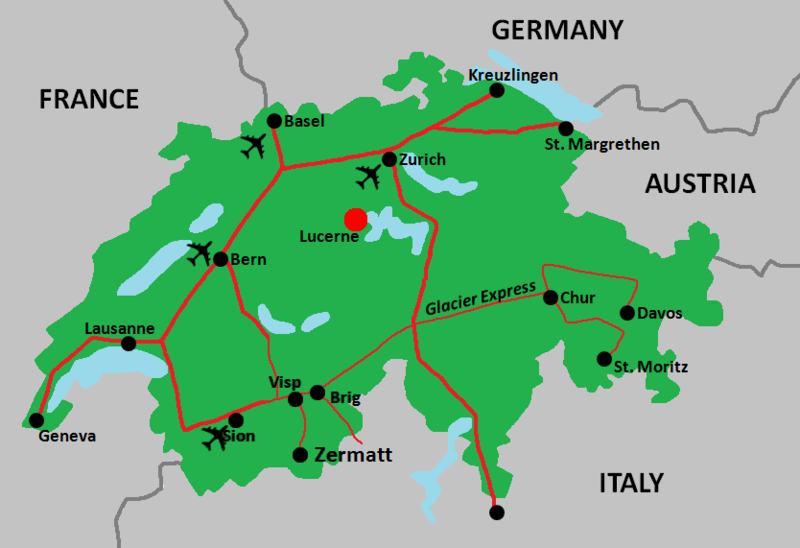 Roughly 3 trains an hour run between Zürich and Lucerne. Some stop at Zug Bahnhof on the way and some routes are direct. 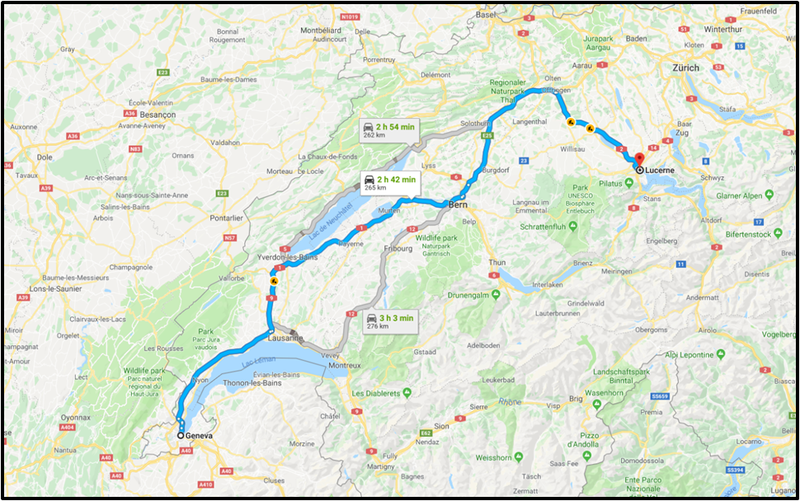 Although more expensive and a longer trip than travel from Bern or Zürich, the trip from Geneva isn’t outrageously long or expensive. 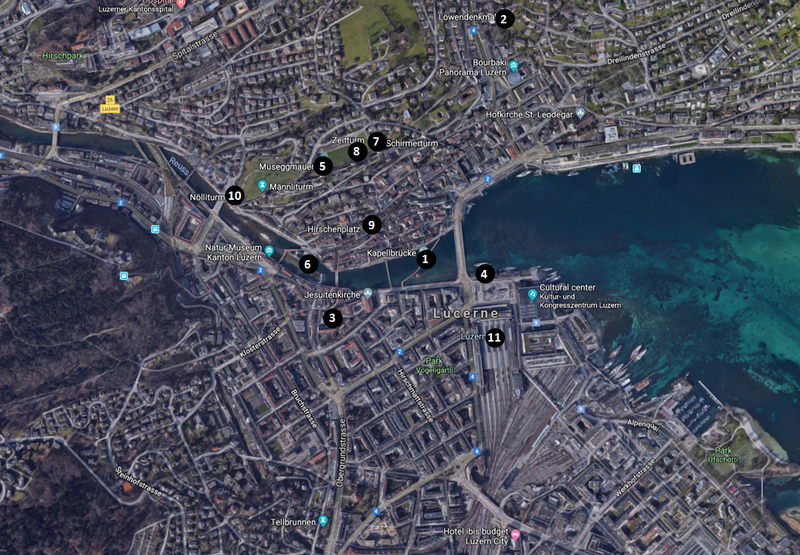 If you would like to combine a visit to Lucerne with your trip to Geneva, a train ticket will cost you roughly $79.67 and the trip will take about 3 hours. There are roughly 3 trains that run between Geneva and Lucerne each hour, so it isn’t too difficult to catch one throughout the day. Roughly 3 trains an hour run between Geneva and Lucerne. Some stop in Olten on the way, some stop in Olten and Bern, and some routes are direct. If you would like to have a little more flexibility in your travel than a train affords, another option that you have when visiting Switzerland is to rent a car. 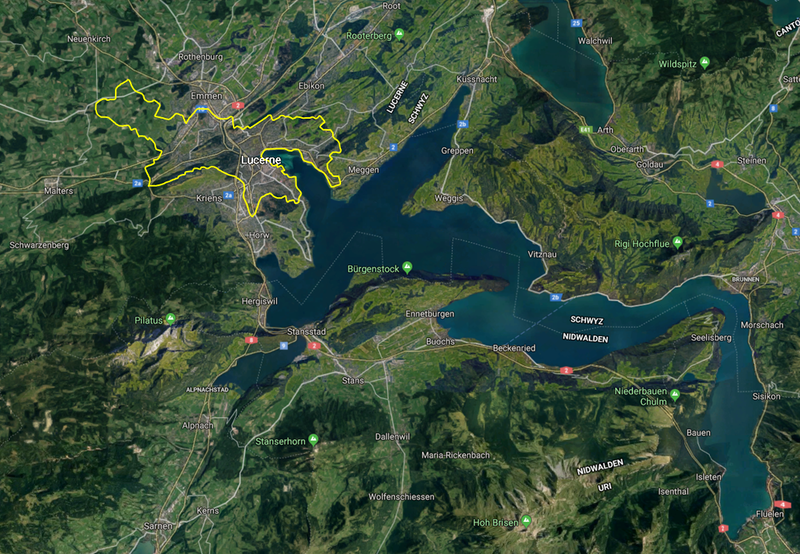 Switzerland has a very well maintained road system that accesses much of the country, but you won’t be able to access some of the areas in higher elevations with your car. Luckily, Lucerne is very accessible by car if you would like to rent one for your trip. Not only that, but the drive from Bern, Zürich, and Geneva to Lucerne are relatively short and easy. The one thing you will want to be aware of is the weather. Because much of Switzerland is at high altitude, you will need to be prepared for poor weather conditions if you are going to drive. 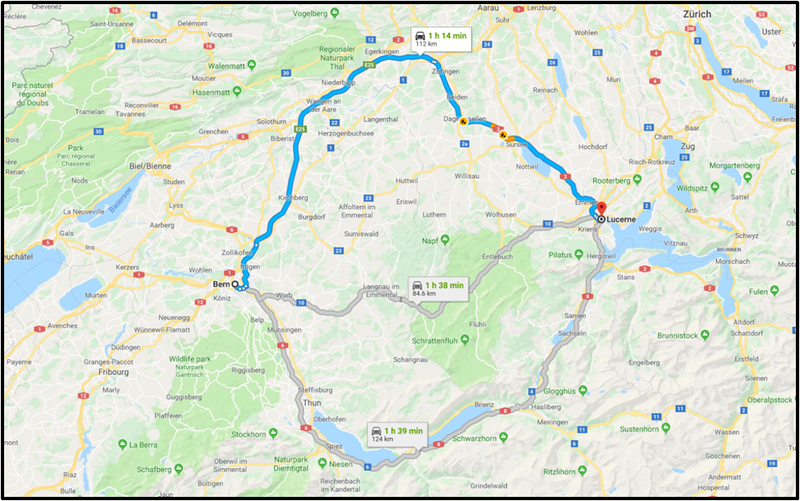 To give you an idea of how long it would take to drive to Lucerne, I have included some driving maps below for you to review. As I mentioned previously, Switzerland is the most mountainous country in Europe, so the Temperature is going to vary quite a bit depending on what altitude you are going to be visiting. When you visit Lucerne, you have a mixture of altitudes as the city itself sits at only 1,385 feet (or 391 meters), but the city is surrounded by the Alps, which are obviously much higher. In addition to temperature, other factors that you will want to consider before planning your trip to Lucerne are the levels of precipitation you will likely see and the number of other tourists that you will have to deal with when you are there. In this section, I outline all of the factors to help you determine what time of year it would be best to plan your visit. As you can see in the chart below, the Summer months of June thru August can be rather warm, but not too hot, while the winter months of December thru February can be cold, but not too cold. In my opinion, when it would be best for you to visit will depend largely on what you want to do when you are there. If you plan on spending a lot of time out on Lake Lucerne, winter is probably not the best time to visit. If you plan to visit the adjacent mountains to do some skiing, then the summer months probably isn’t the ideal time to visit. However, if you plan on visiting just to see the city and the sights, there really isn’t a bad time to visit Lucerne from a temperature standpoint. A big factor that you will want to consider when planning your visit to Lucerne in the amount of precipitation that the city receives. As you can see below, Lucerne gets considerably more precipitation during the summer months than it gets during the rest of the year. In fact, the months with the lowest amount of precipitation happen to be during the winter months of January and February. If you are planning on doing a lot of hiking or being outside, this might be an important consideration. Personally, I like the autumn months of October and November because they typically see less precipitation than the summer months and aren’t as cold as the winter months. The final factor that you will want to consider when planning your trip to Lucerne is the number of tourists that you can expect to be visiting the city. While exact tourist numbers are hard to find, using the number of tourism searches for Lucerne on Google is typically a fairly accurate indicator. The below is from Google Trends and shows the relative amount of Google searches for the Lucerne area by tourists throughout the year. The numbers are calculated relative to the peak month, which is early March. For instance, June 3rd saw roughly 76% of the searches for “Lucerne Switzerland Travel” as the day of March 3rd, which was the peak day. The best time to visit and miss the crowds just so happens to be late summer into autumn. Choosing where to stay is an important factor when planning any trip, and it is no different when visiting Lucerne. You will want to be somewhat close to all of the tourist sites and activities, be comfortable where you are staying, but not break the bank on accommodations. To help you decide which hotel or hostel is the best fit for you, I have included several recommendations at different price points below. All of these options are in good locations for tourism and all have excellent reviews on TripAdvisor. The food you eat when you travel is a big part of your travel experience. Having great experiences at restaurants and trying really good food can really elevate a trip, just like having bad experiences at restaurants or trying bad food can really put a damper on a trip. 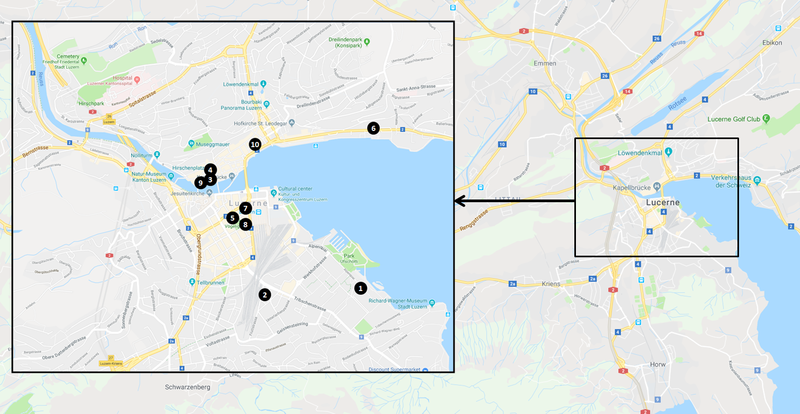 To assist you in locating some highly rated and recommended restaurants in Lucerne, I put together a list of some of the top-rated restaurants in Lucerne on TripAdvisor. A few of these restaurants I have personally tried and really enjoyed. If you are looking for some great places to grab breakfast, I would suggest you check out Mill’Feuille and Des Alpes, which are both restaurants with amazing breakfast options. If you would like to add a little bit of adventure to your trip, or if you are just interested in learning more about the history, culture, and food in Lucerne, there are some amazing tours and excursions that are available. To assist you in finding the right tours that fit your needs, I have included a wide variety of highly rated tours for you to review below. Lucerne is a beautiful city with a lot of amazing things to see and do. To assist you in planning your time while in Lucerne, I have included some of the top sights and experiences in Lucerne for you to review in this guide. To help you get orientated, I have included a map of the general area surrounding Lucerne below. The key locations you will want to be aware of are the main train station in Lucerne (in case you want to take excursions outside the city), the location of the Cog rail to the Swiss Alps (which is accessible from Lucerne by train or boat ride), and the lift\train station to access Mount Pilatus (which is one of the most dominant features surrounding Lucerne). In the city of Lucerne itself, there are a lot of amazing things to see and do. To assist you in your planning, I have listed the top attractions that I would recommend below. When I laid out the hotel recommendations in this guide above, I tried to keep the hotels as close as possible to the majority of these tourist sites. It is almost impossible to miss because Mount Pilatus is the most dominant feature in the landscape surrounding Lucerne. At 6,995 feet (or roughly 2,123 meters) it is an impressive mountain to look at. If you would like to get some spectacular view of Lucerne and the surrounding area, there are a few ways to get to the top of Mount Pilatus. The first is the traditional cog railway, which happens to be the steepest railway in the world. The other option is an aerial cable car (pictured above) that will take you to the top of Mount Pilatus. 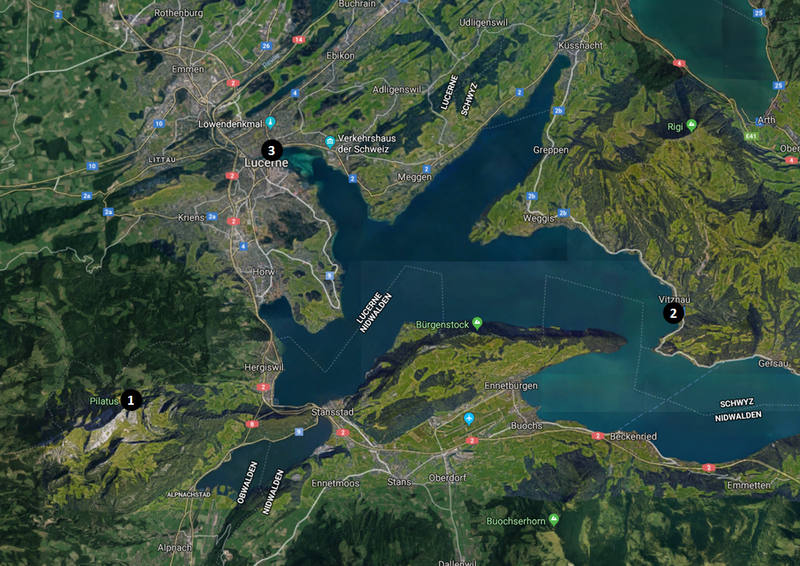 The map above shows the different options for getting to the top of Mount Pilatus. The easiest option is to take the aerial cable car, known as the Dragon ride, to the top of the mountain. The other option is to take either a train or ferry to the town of Alpnachstad on the other side of the lake. From there, you can take the steep Cog Railway to the top of Mount Pilatus. The Chapel Bridge, which is known locally as Kapellbrücke, is arguably the most famous structure in the city of Lucerne. This beautiful wooden, covered footbridge over the Reuss river is the oldest wooden covered footbridge in Europe and is often decorated with flowers. Inside the bridge you will find many paintings that date back to the 17th century (like the one below), although many of the paintings were destroyed in a fire in 1933. It is a great place to take a stroll while touring the city. One of the most moving features in Lucerne has to be the Lion Monument. The Lion of Lucerne, which is known as Löwendenkmal locally, is a carving that was designed by Bertel Thorvaldsen and hewn in 1820–21. The monument was built to commemorate the Swiss Guards who were murdered during the French Revolution in 1792. It is widely recognized as one of the most moving sculptures ever created. In fact, the American writer Mark Twain once referred to the Lion of Lucerne as “the most mournful and moving piece of stone in the world”. If you are going to explore the city of Lucerne, which I highly recommend you do while you are in town, then one area that you absolutely need to explore is the Old Town area. There are a lot of really beautiful old buildings in the area, as well as neat shops and fantastic restaurants. When I visited Lucerne, we spent a good amount of time just walking the streets of Old Town and enjoying this beautiful part of the city. In addition to places already on this list (such as the Chapel Bridge), there are a number of places in Old Town that I recommend you check out. Town Hall, the Kornmarkt, and Jesuitenkirche are my favorites. No trip to Lucerne is complete without a boat ride on Lake Lucerne. It is such a big and beautiful lake with breathtaking mountains as a backdrop. The docks for the boat tours are within walking distance of the train station and the heart of Old Town, so it really isn’t too far out of the way. If you purchase a Swiss Rail Pass while in Switzerland, the boat ride is free of charge. If you don’t have a Swiss Pass, then I would recommend that you look into a Lake Lucerne Panoramic Sightseeing Cruise, which is really quite affordable. One of my favorite things that we did while in Lucerne was to take a train up into the Swiss Alps. I cannot begin to explain how beautiful it was up there, nor will any pictures that I post do the experience any justice. It really is a can’t miss experience that you really have to enjoy for yourself. To get to the train station to take you up into the Alps, you will want to take a boat ride from Lucerne to the Vitznau Train Station on the other side of Lake Lucerne. From there, you can take a train up into the alps. As you can see below, the views from up in the Alps are absolutely breathtaking. We took the train up to the top and then hiked back down to the train station. It was one of the most beautiful and breathtaking hikes that I have ever done. Make sure you have your camera with you as you will want to take a lot of pictures. Another fascinating feature in Lucerne that is worth exploring is the historic Musegg Wall. This 13th Century fortification that stretches around the Old Town of Lucerne is very well preserved to this day. If you would like to tour the wall, four of the wall’s towers are open to tourists. The most notable of these towers is the Zytturm Clock Tower, which I discuss below. After a long day exploring the city of Lucerne and the surrounding areas, a great way to finish the day is to take a walk down by the Reuss River. After exploring the Chapel bridge, you can walk thru Lucerne following the river. There are a lot of great restaurants and shops to stop at and the river walk is absolutely beautiful. Most notable of the Musegg Wall’s towers that are open to the public, the Zytturm tower is worthy of a visit because it houses the city’s oldest clock. Built in the year 1535 by one Hans Luter, it strikes the hour one minute before all other clocks in the city. It is a beautiful tower with a lot of history, which makes it a must see when visiting Lucerne. Hirschenplatz, which is also known as Stag Square, is one of the most famous squares in Lucerne. There are beautiful old buildings and breathtaking facades in the square, which are worthy of visiting to see on their own. The square has historical significance because it used to be used to hold the city’s hog market. Another one of the famous towers in Lucerne’s Musegg Wall, I think the Nölliturm might be the prettiest of the towers. This tower is the closest to the Reuss river, which is why I think it is the most beautiful. Built around 1500, the tower has recently undergone some renovations. It currently belongs to the Safran Guild and is open to the public. No trip to Switzerland is complete without an authentic fondue dinner. The cooking style originated in this region and they do it by far better than anywhere else I have eaten it. Some recommended restaurants in Lucerne for a good fondue meal include Fondue House, Schiff Restaurant Wilhelm Tell, and Zunfthausrestaurant Pfistern. Another absolute must when you visit Switzerland is trying the delicious Swiss chocolate. Whether you are looking for just a little taste or would like to buy a big sheet of this sweet deliciousness, there is something for everyone with a sweet tooth. Some great places to try for really good chocolate include Läderach, Max Chocolatier, and Lindt Chocolate Shop. Lucerne, Switzerland is a magical place. In addition to having some absolutely beautiful scenery, the city of Lucerne itself is both beautiful and charming. Below is a gallery of just some of the pictures I was able to take during my visit.